We’ve mused about this. How involved was the White House in Abdelbaset Ali Mohamed al-Megrahi, the Lockerbie bomber’s release from the Scottish prison? And was their involvement tied to the campaign donations from BP to Obama? A letter obtained by the UK Sunday Times reports to show that Obama preferred Abdelbaset be sent home to Libya, but not imprisoned there, and a letter from the US Embassy Deputy Head in London, Richard LeBaron has surfaced. The U.S. Senate Foreign Relations Committee has been investigating how Abdelbaset was released from the Scottish prison on compassionate grounds, sent home to Libya to die within three months, and is still alive one year later. At the time, it seemed the U.S. did not heartily oppose the release. I remember Obama telling Libya to quash any idea of a big reunion celebration on camera when the bomber arrived home. Of course the cameras rolled and the celebration was big. Obama received a total of $77,051 from BP leading up to his presidential race in November 2008, millions more went to Democrats. In the summer of 2008, BP was desperately trying to find a way to get their drilling operation off of Libya’s coast operating. It appears Libya was holding those leases hostage to obtain Abdelbaset’s freedom. By August, whatever deals were cut, the bomber was released and sent home. Rumors were ripe that Libya paid Scottish doctors to issue a terminal cancer diagnosis. The document, acquired by a well-placed US source, threatens to undermine US President Barack Obama’s claim last week that all Americans were “surprised, disappointed and angry” to learn of Megrahi’s release. Scottish ministers viewed the level of US resistance to compassionate release as “half-hearted” and a sign it would be accepted. The US has tried to keep the letter secret, refusing to give permission to the Scottish authorities to publish it on the grounds it would prevent future “frank and open communications” with other governments. In the letter, sent on August 12 last year to Scottish First Minister Alex Salmond and justice officials, Mr LeBaron wrote that the US wanted Megrahi to remain imprisoned in view of the nature of the crime. The US administration lobbied the Scottish government more strongly against sending Megrahi home, under a prisoner transfer agreement signed by the British and Libyan governments, in a deal now known to have been linked to a pound stg. 550 million oil contract for BP. Why would the White House strongly oppose Abdelbaset’s imprisonment in Libya? The letter does say that Obama preferred leaving him in prison in Scotland, but if that was not going to happen, preferred the bomber go to his happy home in Libya and not to prison. It doesn’t make any sense unless we see the donations going to Obama as conditional. 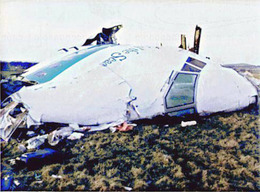 The Lockerbie bombing, also known as Pan Am 103, killed 190 Americans, 35 of whom were students of Syracuse University, 4 from Colgate University, 4 from Brown University, 2 from Seton Hill University and 2 from State University of New York at Oswego and 1 from Hampshire College. Ten on the flight were residents of Long Island. Justice for the 243 aboard and the 11 dead on the ground was stolen for a BP oil lease, some political donations and a favor to an Islamic nation. Just a few strong words from the Citizen President of the World, Barack Obama, saying Abdelbaset must not be realeased, would have kept him in prison. Obama hates drilling, but he loves campaign money, and he is a great respecter of Islam. What a terrible, terrible story. Thanks to David Lemon for the heads up on this latest revelation. Bay of Rigs Scandal Leaking: Dispersants and Where the Money Is. Saif al-Islam is Muammar Ghaddaffis Son Megrahi Lockerbie Bomber Release Deal?